With a stay at Comfort Inn in Lafayette, you'll be 6.2 mi (10 km) from Purdue Memorial Union and 9.9 mi (16 km) from Ross-Ade Stadium. Featured amenities include a 24-hour business center, express check-in, and express check-out. Planning an event in Lafayette? This hotel has facilities measuring 888 square feet (82 square meters), including a meeting room. Free self parking is available onsite. Located in Lafayette, Economy Inn Lafayette is within a 15-minute drive of Ross-Ade Stadium and Purdue Memorial Union. Free self parking is available onsite. 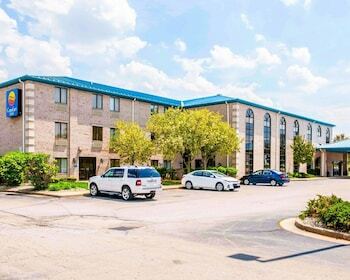 With a stay at Super 8 by Wyndham Lafayette in Lafayette, you'll be 5.4 mi (8.7 km) from Purdue Memorial Union and 6.1 mi (9.8 km) from Purdue University. Free self parking is available onsite. With a stay at Prestige Inn West Lafayette, you'll be centrally located in West Lafayette, within a 10-minute drive of Ross-Ade Stadium and Mackey Arena. Free self parking is available onsite.